Are you running a WordPress installation on Google Cloud Platform? If so, it is important that you have a system to remotely manage your WordPress files on Google Cloud. For those of you who are experienced WordPress users, you’ve probably broken your site before. You’re well aware that a simple plugin malfunction or php code error can lock you out of your WordPress site. When a plugin or code error breaks your WordPress site, you’ll need to be able to manage WordPress files on Google Cloud using a back-end method. In this type of situation, when you’re unable to access your WordPress dashboard, don’t lose hope. You can still access your WordPress files remotely using an SFTP client. 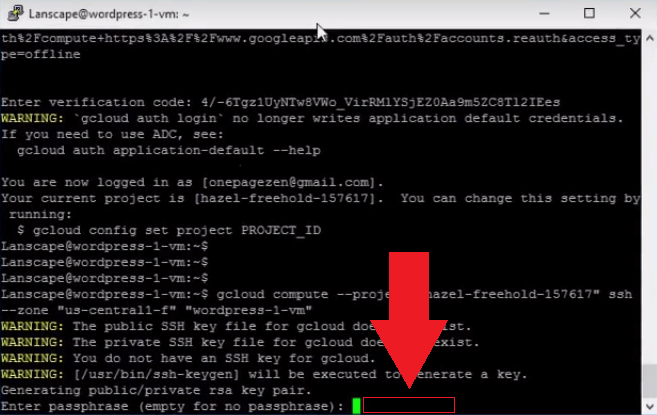 In the video above I show you step-by-step how to configure an SFTP client for your WordPress Google Cloud installation. If you are new to Google Cloud and are unfamiliar with the command-line-interface, check out the Google Cloud FTP tutorial for beginners. To install the Google Cloud SDK, visit cloud.google.com/sdk. After installing Google Cloud SDK, the terminal will open, and you will be asked to log in. Type “y” and press “enter”. Your browser will open up your Google accounts page, asking you to grant permissions for Google Cloud SDK. The Google Cloud SDK will now ask if you want to configure Google Compute engine. Type “y” and press “enter” to continue. Next you will be prompted to select a zone. Either choose the zone that you selected when setting up your instance, or choose “21” to not set a default zone (recommended). 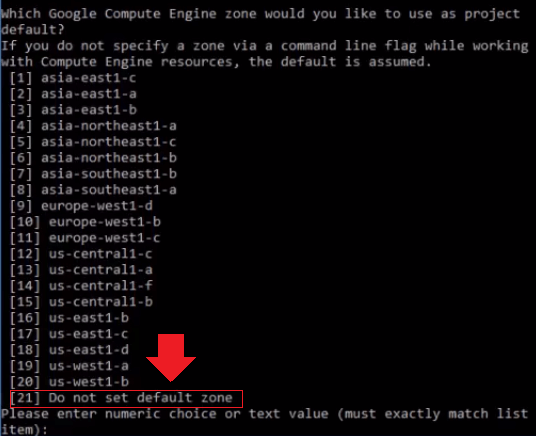 After selecting your zone, go back to your Google Cloud Platform instance dashboard, and click the arrow next to the SSH button and select “View gcloud command”. Select and copy your gcloud command. Go back to your SDK terminal and paste the gcloud command. After you paste your gcloud command into the SDK terminal, a PuTTY terminal will launch. Paste you gcloud command into the PuTTY terminal. The PuTTY terminal will generate SSH keys. When asked if you want to enter a passphrase, leave the field empty and press enter. Your SSH key files will be saved into your computer files. You can locate your keys at: Windows (C:) > users > yourusername > .ssh. Open FileZilla, and go to Edit > Settings. If you don’t have FileZilla installed, you can download it here. In the settings page, under Connection > SFTP, click on “add key file” to upload your SSH key file. Choose the middle SSH PuTTY key file. 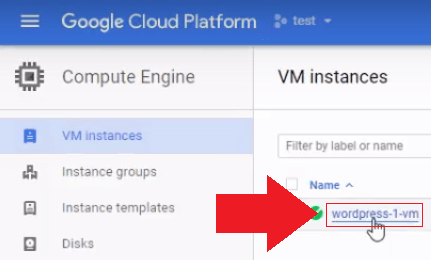 Go back to your Google Cloud platform VM instances page, and click on your WordPress instance. Click on the “edit” button on the top of the page next to the VM instances header. Scroll down to the middle of the page where it says “You have one SSH Key”. Click on “Show and edit”. Go back to your directory where your SSH keys are saved ( Windows (C:) > users > yourusername > .ssh), and select the bottom SSH key file. Open the file, and copy the entire text. Paste the entire contents of the key file into the SSH text area on your VM instance page. Select the very last part of the text (which identifies your PC), and delete it. Replace the deleted text with the name of your WordPress installation. If you’re using the Bitnami WordPress installation, you will add “bitnami” at the end of the text. Next, go up towards the middle of the page and copy the external IP address. Then, scroll to the bottom of the page and click the save button. Go back to FileZilla, and paste the external IP address in the host field. Make sure to put “sftp://” before it (see picture). In the username field enter “bitnami”, and click the “Quick Connect” button to connect your WordPress instance. Success! You are now connected to your WordPress instance and will be able to use the FileZilla SFTP client to easily manage your WordPress files. If you run into permission errors, click here to fix the problem. If you are looking for the quick-start version of this tutorial, you can check it out here. Please leave any questions and comments below! Dude, I followed every single step it’s connecting perfectly. but, but, but. You will need to first edit the permissions of those files in order to delete them. I followed all the first 5 steps without any problem but at step 6 when checking the VM Instances page i don’t have “You have one SSH key” but “You have 0 SSH key”. Any idea what could have gone wrong? I had the “Could not fetch resource: – Insufficient Permission” error messaged but i followed Leron Amin’s recommendation of ‘gcloud auth login’ to go past it. So shouldn’t be the reason why. I had a “Error establishing a database connection” issue when I tried to open my website. I followed this “Manage WordPress Files on Google Cloud Platform” tutorial to the end. However, I am unable to find my wp-config.php file or WordPress root directory. I do not know where is it. Do you have any suggestion on how to find it? 2. I noticed that there is a “root” file folder (which I do not know whether it is even relevant…). However, when I tried to open it, I get the following error message. 3. The links below show all the file folders in my remote GCP site. Have I made a mistake somewhere? Can you suggest what should I do? I would recommend that you view/edit the file in the terminal, that way you won’t face any permissions issues. If you try to edit the file through FileZilla, is it likely that you will run into permissions issues. I’m not using the Bitnami version of WordPress. I selected the click-to-deploy from within Google Cloud. 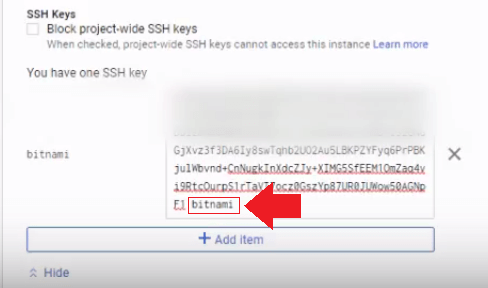 I tried entering “Bitnami” at the end of the SSH key because you used this word in your tutorial. I don’t know the name of my WordPress installation. I saw a comment that we can replace “Bitnami” with any username we fancy. I also read a feedback that that person had to use a username associated with his vm instance. I don’t know if this impacts access to files. I managed to find my WordPress files at /var / html. Only when I tried to upload a modified wp-config.php file did I realise that all the WordPressfiles are read only. In Filezilla, I could see an option to change file read/write/execute permission when I right-clicked on the files. However, I was denied permission to make any changes. I was not able to upload a modified wp-config.php file. Any suggestions for how to proceed for non-Bitnami WordPress? I would recommend using this version of the FTP tutorial – it’s a bit more straightforward. When you paste your public key file contents (as shown in step 6), it should automatically include a username. Copy this default username that appears next to the keyfile and add it to the FileZilla username field when you connect to your instance. Also, you will need to change the permissions of the directories before you are able to edit them. I won’t be doing a Mac version of the tutorial, but if you look through the comments section for this tutorial, some other users have already provided links to tutorials which show how to implement an FTP/SFTP solution on Mac. First of all thanks for the specific and stepwise information. Great Work. I am not able to see or fetch the wordpress structure. No wp-admin or other folders are visible. Make sure to click the folder in the Remote site box, as this will expand to display all of your other website files. 777 but problem is same how to i solve it. 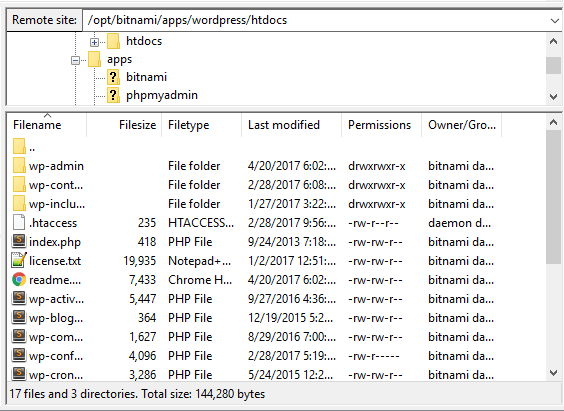 I have installed wordpress installation on gcp and not bitnami. However, I followed your command. Is that fine? Secondly, I got access through filezilla to wordpress instance. However, the folder with wordpress files is still out of my reach. I am facing issues in “error establishing database connection”. I need to fix those files as soon as possible. 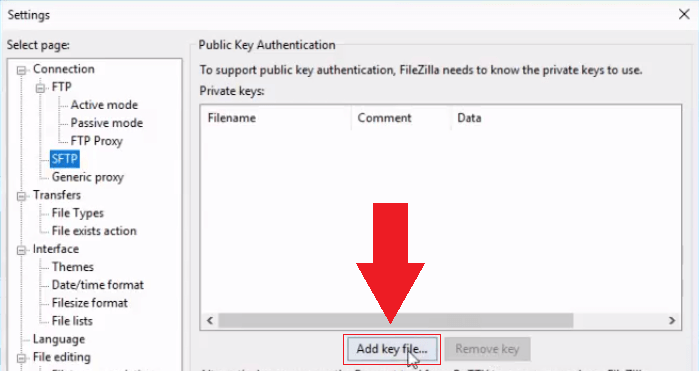 Did you make sure that you uploaded your private key file to FileZilla (step 5) and that you added your public key to your GCP VM instance (step 6)? Also, that database error may indicate a problem in your wp-config.php file with your database credentials. First thing I would do is check your credentials in the file (database name, username, password, etc. ), and then do a google search for “wordpress error establishing database connection” – as I’m sure you’ll find many more resources on how to fix the problem. Hi Leron I need your help ASAP. Please provide additional details about the process you used to configure your subdomain, that way I can target where the error is likely originating. Also, please use this Facebook forum for further discussion, as your issue is unrelated to this tutorial. Thanks for responding. I have been able to resolve the problem. Apparently it was just a simple Apache configuration setting error. Can you make a tutorial on how to create a sub-domain in GCP? I’m sure it’d be helpful to the community. Will do! Thanks for the feedback and I’m happy to hear that you were able to get your website working. I changed my website to WordPress and I was forced in the real problem occurred while raising the ability of the processor and the site was a quick ephemeral “via Google hosting” and thank God able to link the site on the site but I brought the problem of my site when I try a slot from Google browser via the laptop you have prepared But it opens but if you enter from the mobile, in other words, the Safari browser opens in about a quarter of an hour. I entered the settings of the board php and changed the IBI from the board I said this can help but to no avail Is there another way to now get my site and it is closed I can not include new articles I am afraid to dull visitors, especially I am marketing oil derivatives and visitors are very limited Top visits There were 500 visitors. Are there any ideas about this problem that I will be denying you? Please provide a more concise description of the issue you’re experiencing and I will see how I can help. Great – I’m glad that you were able to get the problem resolved! Check out this thread for instructions on configuring FTP on AWS. But overall it was very enlightening experience (to use a Zen metaphor) and although I ran into a few differences, i got it to work with a little searching and investigating! and I learnt a few other things along the way. I worked out how to log back into my instance in the Terminal using the following command: gcloud compute ssh –zone once logged in. I can’t reiterate enough how useful this tutorial was in helping me get through to step 7 successfully. It was definitely the right way to install the Google Cloud SDK then link the SDK to your Google Account even though I didn’t have a WordPress installation it still worked for my Moodle vm install. Thanks again Joe. Have a lovely day. I am glad to hear that you were able to figure everything out! I know that having to generate a key pair through the terminal can be a bit of a hassle, but it’s great that you were able to figure it out. That being said – I haven’t had to use Mac for most of the stuff that I do, so I may have to reference your comment at some point if I ever end up doing GCP configurations on a Mac – so thanks for the great tips! Also, I’m glad to hear you were able to get your Moodle project running on Google Cloud. I know it took a bit of ‘tweaking’, but I have a feeling you will be impressed with the performance. First of all, thank you Leron for this another detailed tutorial but since I’m using Mac I’m not sure if I have properly followed your instructions. I was able to follow steps 1, 2 and 3 though some parts are not totally the same as your guide since I’m using Mac. On step 4, I’m using Mac’s default terminal instead of PuTTY terminal. Below is the screenshot of the output of the terminal. 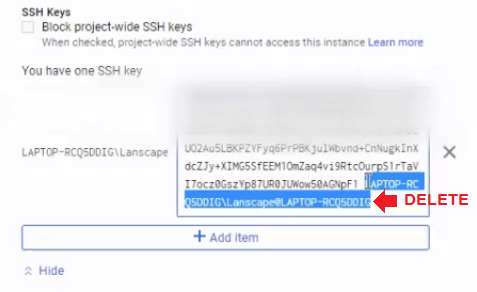 One of the SSH key file generated was different from your screenshot in step 4. Below are the SSH key files generated by Mac’s default terminal. I believe the 1st file is the same as the middle SSH PuTTY key file on your screenshot while the 2nd file is the same as the bottom SSH key file. 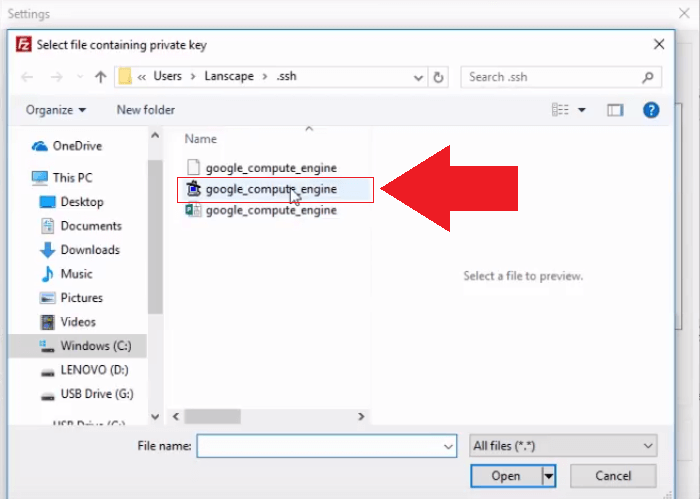 In step 5, I added the SSH key file ‘google_compute_engine’ without the .pub extension on FileZilla. In step 6, I opened ‘google_compute_engine.pub’ file using Google Chrome and copied the entire content and paste it on the SSH text area on my VM instance page. 1st try, I replaced the last part of the text with any name that I want. USERNAME: Used the username that I used in the SSH text area on my VM instance page. Tested different versions as mentioned above. @Benjamin, I believe you have some idea on this issue hope you can help me on this. Hopefully someone has some idea on how to fix this issue. I didn’t use the Quickconnect feature in FileZilla. I used the File Manager to set my connect up. I don’t think the Quickconnect will work. I have uploaded a screenshot of my settings page and have only blurred out the host address but all the other setting appear there. The main thing is to point to the local .rsa key file. And I used the following video as a guide it is on connecting via SSH and SFTP using FileZilla on a Mac. I’ve been waiting for this answer. More power to you and to Leron! Thank you for your tutorials. They have been very useful for me. They are very well explained. They are a great asset for the whole community. Thanks for the feedback Julio! I am glad to hear the tutorials have been helpful to you! Joe, This has been an amazing tutorial. Thanks for the time you put into it! I followed along, ran into the same spot of trouble that the above commenter ran into (insufficient permissions) and your suggestions for him worked for me as well. I hope that you can help me, though, with an expected complication. When I connected through file zilla there were no APP files (really no files at all in the bitnami file folder or the other file folder that had my username) and now when I connect to my wordpress site (using the external ip) it can’t connect. I seem to have lost the entire site. I have a hard copy backup on my computer but before I go through that process I was hoping it was something simple that I could do to restore what I had. Did you reserve a static IP for your website? If not, that may have caused the issue. I don’t think your entire site would be lost due to establishing a connection with Filezilla, there are likely other factors at play. What happens when you try to access your website? What does the page look like, and what error is it showing? The more details you provide the more easily I will be able to help you address the problem. I get the classic “this site can’t re be reached” error in the web browser. This is the case even when I use the external IP (35.164.215.223) found on my compute engine details (I also wondered about a change of IP, but it seems to be the same I have forwarded as always). I used http://www.cloud.google.com/wordpress/ to set up the wordpress set on google cloud. The site was working before I tried started to play around with key pairs and after I got filezilla connected I couldn’t find the site anymore. Is your A record in your Cloud DNS pointing to 35.164.215.223? Also make sure your VM is running. If you didn’t have a static IP address reserved for your instance and you stopped your instance for any amount of time, it could have been assigned a new external IP (different from the one your A record is currently pointing to). So the first thing I would recommend doing is to going to your Cloud DNS, checking your A record, and making sure it matches the external IP assigned to your virtual machine. When I tried to install google cloud SDK, it always has the same error: failed to fetch listing components from server. I have set up filezilla according the following tutorial though, not sure if I need to install google SDK again? 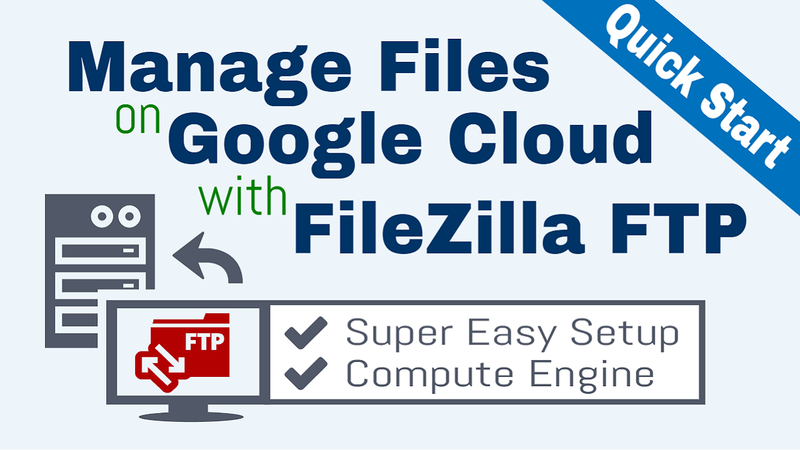 Manage WordPress Files on Google Cloud Platform and Google Cloud FTP Setup with FileZilla (Quick Start) ? Are they serve the same functions? Look forward your reply, thanks. The Manage WordPress files on Google Cloud tutorial integrates two separate tools: FileZilla and Cloud SDK. However, a lot of users only want to use FTP and not Cloud SDK, which is why I created the FileZilla Quickstart. In your situation, you should likely be using the FileZilla Quickstart tutorial. If your Google Cloud projects become more complex over time, then you might look into installing SDK as well. Check out this tutorial about fixing permission errors on FTP. 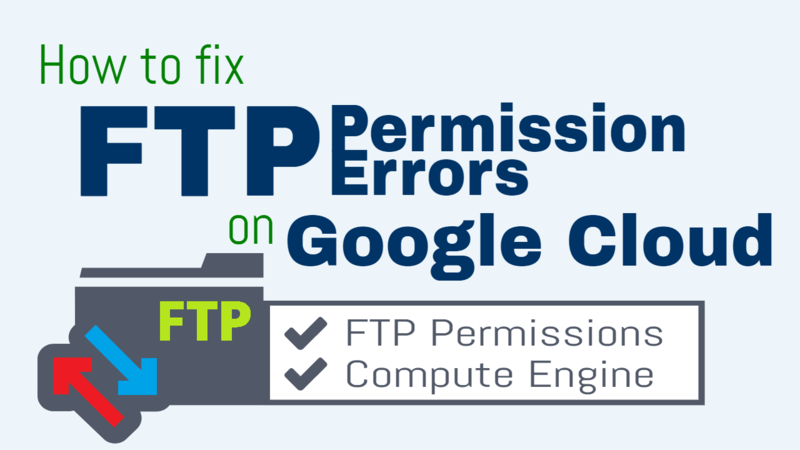 Check out this tutorial on how to fix FTP permission errors. The default zone properties are stored in the MetaData section of your Google Cloud project. to edit these setting, run the command in the documentation here. Just make sure to change the command with the default region and zone that you wish to use for your projects. Hi ! Thank you very much! I followed you here from your youtube channel. I want to know how can I find the path of wordpress files in Google Click-to-deploy type installation, I’m trying to find the principal folder and I don’t find it. Hope you can help me! Thanks! Thanks a lot for your helpfull videos! https version is not accessible at all. You will receive an error message notifying you if Apache is unable to restart. Did you configure a password for your SSL certitificate? Check out the first solution and see if it works. Thank you for your replies, really means a lot. Looks messy if I post it directly here. Ok – What was the tutorial that you were working on that caused the problem? The SSL tutorial? It was this tutorial that caused the problem. I successfully installed SSH and had https version of website. But after this tutorial I got this error. But I will set it up again, I have a backup so I will configure SSL, email and this tutorial. I messed something up most likely because I have followed this tutorial many times before on another websites and it worked everytime. Thank you for your support, amazing work with onepagezen, don’t know what I would do without your tutorials. I’m glad to hear the tutorials have been helpful to you! Where are you getting the error? In the FileZilla or PuTTY dashboard? Also, thanks for sharing the solution. Myself and many others will find it very useful! hey bro can you create a tutorial on how to create a sub domain with wordpress on it? Will do! If you’re planning on running multiple WordPress sites on GCP I would recommend using the Multisite pre-built solution. However, running WordPress on a subdomain of a domain with more than one CMS would be more complicated to configure. This means that there was an authentication issue. Make sure that you’re using the correct login credentials when trying to access your site via FileZilla. I used “Google click to deploy” to install WordPress. How exactly do I find out the “name of the WordPress installation”? It’s not the project name? Or VM instance? I’m sure this has a simple explanation, but I’m not sure what it is! “bitnami” is simply the username used for authentication. You can change “bitnami” to whatever you want the username to be when you connect to your instance via FileZilla. Great tutorial again. I have a few questions. After setting up a site on GCP with SSL certificates, what is the best way to manage images? Should I be uploading them within the WordPress dashboard or do I have to use FTP (FileZilla) for the SSL to work correctly? Or as an alternative, would it be better to store these image files into a storage Container on GCP and link to them that way? I often ask myself this question, and unfortunately I don’t have a good answer for you. For a basic WordPress blog, I’d recommend just uploading images to your WordPress database through the WordPress dashboard. If you will be running a ‘database’ style website, with an expansive library of large files, you may want to consider configuring storage buckets to serve the data. It just depends on the size and type of site you will be running. Hope this helps a bit, and thanks for posting this comment. Thank you again, I found where was the problem. I had pointed the A record to a wrong IP. It should have been pointed to my account IP at Bluehost. Now it works, though I need to rework many pages, slides and images. Again I appreciate your great tutorials. I am glad to hear that the tutorials have helped you! Let me know if you any other questions as I would be happy to help! Thank you for your excellent tutorials, so clear and easy to follow. I have learned so much from your videos. Basically I did everything to transfer my sites from Bluehost to Google Cloud Platform, by following your step by step tutorials. However, I am stuck with one final thing and that is changing IP address to my real domain URL. While I can access my sites through WP admin, I get error by trying to access using URLs. I really appreciate all you have done to train ignorant folks like me, and will be grateful if you could give me a hint to solve this conundrum. In FileZilla, you can change permissions settings by right clicking on a folder and changing the permission levels. Check out this tutorial about what the numbers mean. Are you trying to change permissions from the FileZilla console? I don’t know how to do that, or if it’s possible with GCP. Then you can try again to edit the files in FileZilla. Thank you for taking the time and answer and also writing tutorials in the first place, You are the only guide on the internet for this topic. Yes I tried to change the permissions through Filezilla by right-clicking on the folder and selecting file permissions instead of the SSH. My real problem is that I have a plugin problem and the developer asked for my FTP account and password to fix it. Can you tell me please how can I provide him with this information? Will he be able to upload the plugin by FTP if I give him the access or I have to change permissions first? Last question is, as you can see I only succeeded to get this far only because of your help and amazing tutorials, Do You think I am better of with platform like cloudways? Is there alot of things I need to know about to run my woocommerce site on google cloud by myself? They would need your private key file, your IP of your instance, and the username attached to the keyfile (which was bitnami in the example I sent you). Also – they won’t be able to upload plugins unless you change the default permissions of your plugins directory. Using Cloudways’ most basic plan (1.7GB RAM 1 vCPU machine) would cost $34.17 per month. Self-hosting on GCP would cost $21.73 for that same configuration. The catch, however, is that a 1vCPU 1.7GB machine is overkill for most WordPress websites. Most of the WordPress websites that I run on GCP are using a micro 0.6GB share 1vCPU machine, which costs around $5.00 per month to run. Also, if you self-host on Google Cloud you can always upgrade your machine and specs if you ever need to. For that reason I would not use Cloudways if you feel comfortable enough hosting your own websites on GCP, because it will save you a great deal of money in the long run. The reason companies like Cloudways exist in the first place is because most people don’t feel comfortable using GCP on their own, or using the command-line-interface, but it seems like you’ve already overcome that hurdle. Anyways, I hope this information helps. If you do end up using Cloudways, please let me know how their service is, as I haven’t heard much about them until now. So before I consider going to cloudways which I hope not for the all the reasons you mentioned, How can I create multiple SFTP accounts so that I can share with developers who need access to the site? I am asking this because when I try to find answer to this on internet they show how to do it easily in cpanel which I don’t have in GCP. So how can I create an account for them then deleted later after they are done? What you could do is create SSH key pairs with unique usernames; these are technically “accounts”. You would add the public key in the SSH keys section of your VM instance’s “edit” page. Then, the plugin developers can use your instance’s IP and the key username (aka “comment”) to access your instance via SFTP. This assumes, however, that you’ve sent the developer your private key and that they added it to FileZilla. To prevent them from accessing your project after they’ve finished working, just remove the public key from your instance’s “edit” page. Ideally, if you are hiring an experienced developer to work on your Google Cloud Platform website, what you would do is follow this tutorial. The developer can decide themselves if they require an SFTP interface, and then configure it themselves if they need to. To delete the user after they’ve finished working, just go to your IAM section and remove their Gmail account from the list; then, they will no longer be able to access your project. Thank for providing so much useful video about google cloud platform. have an error : server refused our key. This is a common issue, that may or may not have to do with the formatting or your key file text. If you still haven’t resolved the problem, check out these tutorials for possible solutions and see if they help. As I help you through the problem I need to know: did you already generate key files? Or was this your first attempt at doing so? Check to see if you have key files located at C:/users/yourusername/.ssh. Based on the nature of the error, it is likely that SSH key files already exist. Your insufficient permission error likely has to do with your access scopes. 1. Go to the VM instances page in the Compute Engine. 2. Click on the VM instance for which you want to change the service account. 3. If the instance is not stopped, click the Stop button. Wait for the instance to be stopped. 4. Next, click the Edit button. 5. Scroll down to the Service Account section. 6. From the dropdown menu, select the desired service account. 7. To change scopes, in the Access scopes section, set the appropriate scopes for your needs. As a best practice, specify only the access scopes that your VM instance requires. If you’re not sure of the proper access scopes to set, choose Allow full access to all Cloud APIs and then make sure to restrict access by setting IAM roles. The key generating tools it not ‘connected’ to your website’s VM or server, so generating a key is not likely the reason why your site went offline. There may be other underlying issues with your server, or VM, that may need to be addressed. The first place I would check is your server logs at /var/log and check what error number your browser is displaying. For example: NX_domain, HTTP 500 Server Error, etc.